Due to unforseen circumstances, the band has cancelled this performance. Please contact the Box Office at 724-836-8000 for a refund or to exchange your tickets for the alternate Rockin’ the Paradise performance scheduled for the same date. Fran Cosmo exploded onto the rock scene when he took over for Brad Delp as the lead singer for the Legendary group BOSTON in 1992. Fran was featured as the lead vocalist on the Walk On Album which sold over a million copies worldwide, certified platinum in America and certified platinum in Canada. Fran’s lead vocals were also featured on four of the songs off the Corporate America Album and both of BOSTON’S Greatest Hits. The song Livin For You, in which Fran also sang lead, on was the only Live BOSTON song ever released on the Greatest Hits albums. Before joining Boston, Fran was a highly respected lead vocalist and was the lead singer and co-songwriter for both ORION THE HUNTER and Barry Goudreau albums. The song So You Ran was an MTV hit and climbed to number #4 on the US Billboard Charts. The band then toured with Aerosmith’s “Back in the Saddle” Tour. The band also features Anton Cosmo former member of BOSTON. Anton wrote and performed four songs off the Corporate America Album and performed as the backing vocalist and guitarist on the 2003-2004 world tours. 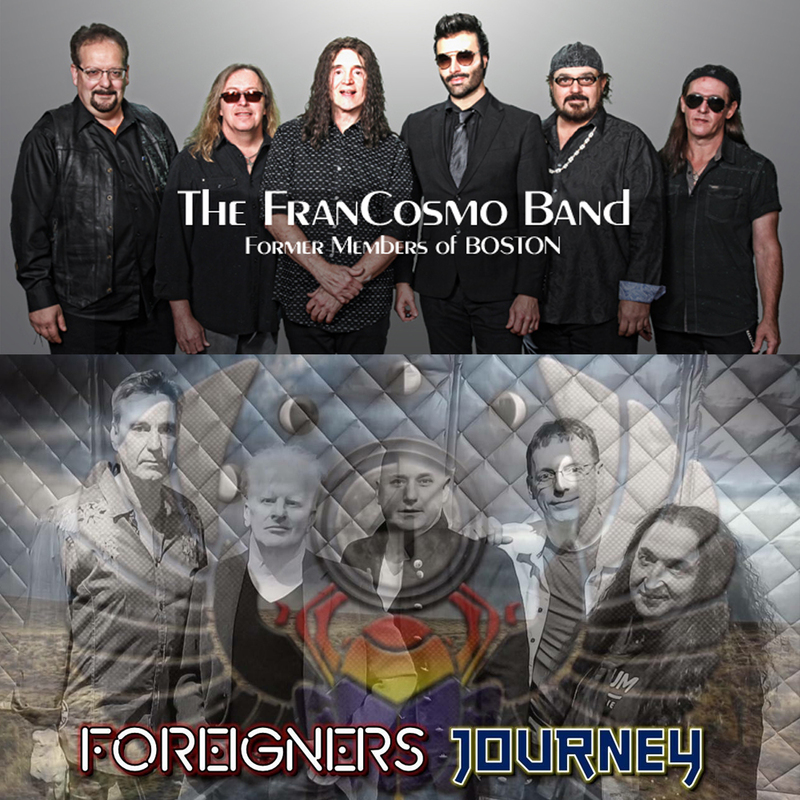 Fran Cosmo, a classic rock legend, is a MUST SEE live performance and is known for his high energy and outstanding vocals that very few can still perform. Bringing together the incredible sounds of two of rocks greatest arena bands of the 80s – Foreigner & Journey. Experience the rock ballads Waiting (For a Girl Like You), I Want to Know What Love Is, Faithfully & Open Arms, along with rock classics Cold as Ice, Urgent, Hot Blooded, Separate Ways, Don’t Stop Believin’ & Anyway You Want It, all performed as the originals were, in their original key and pitch!